Desvenlafaxine (Pristiq) is a drug that is used for curing depression. The mechanism on which is based is SNRI (Selective Serotonin Norepinephrine Reuptake Inhibitor). So, what it basically does is it prevents reuptake of serotonin and noradrenaline, which are both neurotransmitters. The company that produced this medicine, Wyeth, is now known as a part of Pfizer. In the market is another drug with the same active component – desvenlafaxine, and it is called Desfax. This medicine is made as a try for decreasing the side effects of medicines like Effexor (Venlafaxine), which is extremely similar to Pristiq. It took a quite number of years for FDA to approve it. Even when approved, it was still to discuss if there are some big advantages of Pristiq over Effexor. Drugs often used for the same kind of problems (analogy) are Lexapro and Celexa, also from the group of SNRI. 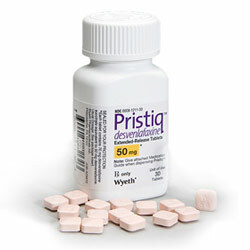 Wyeth company has tried to convince psychiatrists that Pristiq has a fewer number of side effects and that it is much better tolerated by the patients. Pristiq 50mg/day has proven to be effective and well tolerated in short-term trials for treating adults with major depressive disorder (MDD). Problems start to appear when medicine is taken a longer period of time. Your body gets used to function under given dosage (50 mg is starting dose), and after a while the tolerance develops, so you have to increase the dose. When psychiatrists increase the dosage, they double it from 50 to 100 mg, and when your body surpasses that, they may double it again to 200 mg. The main problem is withdrawing from usage, because by increasing the dosage, you train your body to function under larger amounts of medicine. A lot of studies has shown that bigger the dosage does not mean better the effects. They say that anything over 50mg has no benefits. Longer you take it, harder it gets to quit (addiction) and more side effect appear. No one can say exactly how long does it take to withdraw from it. It is personal and depends on any individual, just like a side effect. Tablets are „time release“ wich means that they have the coat which allows them to absorb very slow. Active component stays in organism approximately two and a half days after the last usage. After that, the drug has left the system and the crisis begins. Getting from 50mg to zero mg is very difficult, because 25mg dose does not exist, and splitting 50mg tablets on two is not something that should be done. That way you will damage „time release“ coat, and entire tablet will decompose at once. It can be very dangerous, so it is not advised. Doctors tend to prescribe other medicines, like Sarafem because of their longer half-life, or Effexor. Better results are accomplished by transitioning on other drugs and just decreasing the dose. It is better for your organism than to just stop taking Pristiq out of the blue or a “cold turkey”. Withdrawal symptoms appear because the brain and the body were used to the active component, and without it, they have to adjust to a different drug or no drug at all. You can feel it physically as chills which appear for a few weeks and later subside. You can also feel like you are sick. Many people tend to relive them a couple of times during the drug-free period. Anxiety: In general, all drugs that inhibit serotonin cause anxiety, and here is the reason why. When your serotonin level is low, you feel unhappy, and then you take medicines like Pristiq to treat it, after which your brain receives the help with raising the level of serotonin. When you stop using it, your brain still expects to have that kind of help, and then when it gets out of its effect, the serotonin levels become very low and the anxiety starts. Brain Zaps: Electric vibrations or brain zaps tend to happen too. No one has yet discovered the exact reason of this phenomenon. Scientists are led to believe that this is a consequence of the brain trying to reestablish the balance (homeostasis). In the process of balancing neurotransmitters, physical reaction to that new changes are, so called, “brain zaps”. Chills: As we mentioned above, they appear while the brain and the body are readjusting. They tend to appear for a few weeks, and then disappear, and they can reappear again, but they eventually subside. You can also feel sick, but that also goes away after some time. Concentration Problems: This is caused by reduced cognitive functions. People often describe this as a “brain fog”. Already irritated by all the additional symptoms which can disturb their concentration, this can add on to that and make it unbearable. People can have concentration problems while taking the drug, but in their withdrawal period, it only gets worse. People tend to get better after a certain amount of time. Confusion: This goes hand to hand with brain fog. Confusion is interpreted as a result of not being able to concentrate well. Just like the previous symptoms, this one also gets better during the following weeks. Crying Spells: You can sense being very emotional due to present problem and thanks to the very low serotonin and noradrenaline levels. Patients experience a large amount of emotions that they can not control. It is a big struggle and it usually ends with them bursting into tears. Depression: It is very common to experience a severe depression in withdrawal period. These depressions are worse than depression which was treated, because of which you basically ended up taking Pristiq. This is also caused by homeostatic disbalance in our brain. As your brain balances these chemicals, so does depression decrease and people learn to face the world without these medications. Depersonalization: Just like all others, this one too is a result of a brain readjusting. Nothing feels real to people who are depersonalized. They do not feel like they usually do, so everything is strange to them like they are watching themselves from the outside. Flu-like symptoms: This is a common thing when you start using the drug, but it also appears during rehab period. You can feel chills, have a high body temperature or even experience vomiting. Insomnia: Due to all the symptoms (anxiety, depersonalization, chills) and low levels of serotonin, people tend to have trouble falling asleep. It can get so bad, that it eventually becomes insomnia. People can experience it while taking, or when they stop taking the medicine. Panic Attacks: A large number of people has them. They are a consequence of a high anxiety level. The way to fight this is to keep anxiety to the minimum, do something for the relaxation or do activities that will numb your nervous system. Mood Swings: There can be the mood of any kind, like for an example, you can feel happy one minute and the next one you can be sad, you can be angry and disappointed and next minute you think that you are just doing fine. They can last for a long period of time until the brain is ready to function normally again. Suicidal Thinking: These thoughts can be really intense, and hard to deal with. They are common for withdrawing from Pristiq, and many more antidepressant drugs, and maybe known as the most discussed symptom of all. This is believed to be the effect of a low neurotransmitter level. And there are many more: dizziness, fatigue, headaches, hopelessness, irritability, nausea, sensitivity, sleep changes, sweating (cold sweat), tingling, vomiting. Because every person is different, exact time frame does not exist. Some people need more, some less time to withdraw from this medicine. Someone might have more symptoms, and someone will have less. It is important that during this period you take care of yourself, to get enough sleep, to have your family and friends to support you, to take good care of your body, and drink a lot of water. If you ever had an experience with Pristiq or some other drug from SNRI’s group of antidepressants and want to share your story, please comment in the section below. Previous articleHow Long Does Valium Stay In Your System?